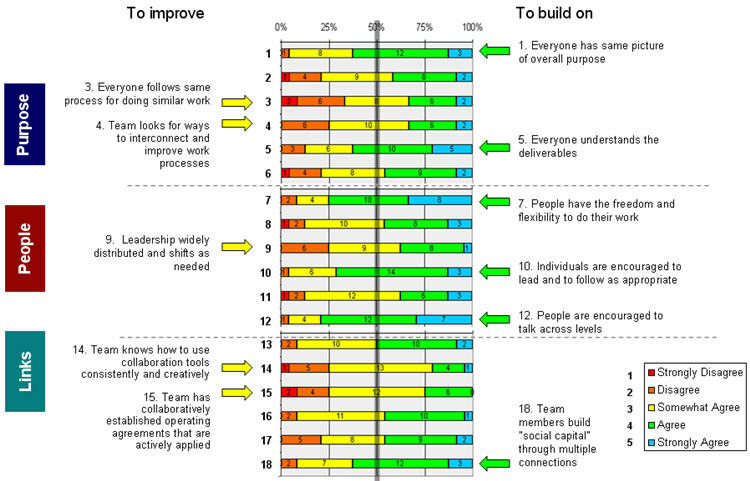 Use the assessment to identify your team’s strengths and to pinpoint areas for improvement. Take the Virtual Team Assessment at any point in your development process. Comparisons of results at different points in the team’s life cycle can be illuminating for the team's collaboration style. The assessment is particularly useful when the group seems stuck and needs the insight that comes from self-diagnosis and reflection. Use the areas in which the team is not as strong as the basis for identifying which building blocks to focus on as well as to draft the team’s Operating Agreements. Remember: Your team’s strengths are just as important as your weaker areas. The more the team excels in particular areas, the more you bring along areas that need improvement.